In honor of World AIDS Day on Dec. 1, 2015, the Forum of International Respiratory Societies and its global members including the American Thoracic Society, have united to increase awareness and improve the health outcomes of people living with HIV/AIDS. The World Health Organization estimates that HIV caused 1.2 million deaths globally in 2014, with 36.9 million people infected overall and 2 million newly infected in 2014. 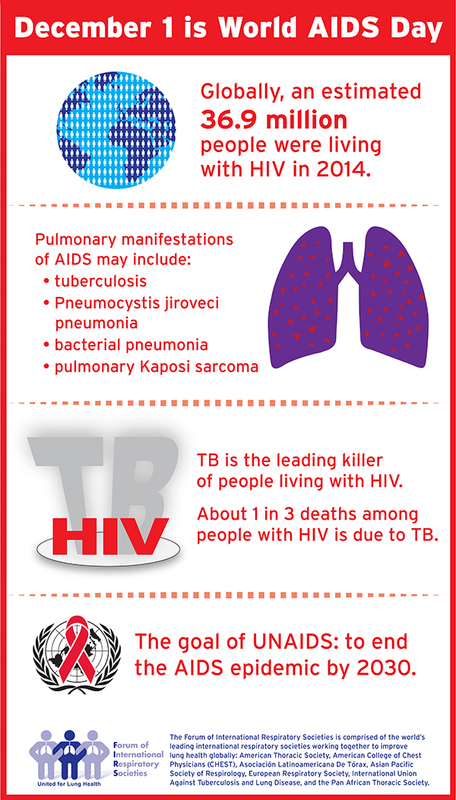 The WHO’s Global Tuberculosis Report 2015 found that the number of TB deaths is now virtually equal to the number of HIV/AIDS deaths globally. Over one in three people living with HIV worldwide are affected, accounting for approximately one in four AIDS-related deaths. Read the press release here.